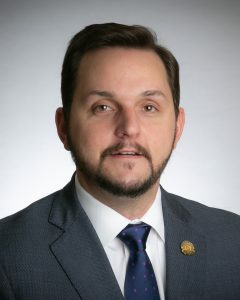 Alex Bynum, Owner and Principal Broker of Wendell Alexander Realty in Dresden (Weakley County), is 2019 Secretary-Treasurer of Tennessee REALTORS®. Alex is a 2006 graduate of Gleason High School and a 2009 UT-Martin graduate with a bachelor’s in Agriculture. Striving to be actively involved, Bynum serves as the Director of the National Association of REALTORS®; Central West Tennessee Association of REALTORS®; Tennessee REALTORS®; 2018 National Association of REALTORS® Broker Involvement Council; 2018 Tennessee REALTORS® Budget and Finance Committee; UT-Martin Skyhawk Board; The Benevolent and Protective Order of Elks Board member, a member of the Dresden Rotary Club, and Weakley County Economic Development Board. He also has served as 2012-2013 Reelfoot Regional Association of REALTORS®, President and 2016-2017 Central West Tennessee Association of REALTORS®, President, Carl Perkins Center for The Prevention of Child Abuse, and Past President of The Benevolent and Protective Order of Elks. Honors he has received include the 2018 Outstanding Young Alumni Award; 2016 Tennessee REALTORS® Presidential Award; 2016 Central West Tennessee Association of Realtors Presidential Award; 2014 Interfraternity Council, UT-Martin, Advisor of the Year; 2012 National Association of REALTORS® 30 under 30, Finalist; National Association of REALTORS®, Political Action Committee (RPAC), Presidential Circle Golden R Investor; 2006 Weakley County Chamber of Commerce Youth Award; 2006 Future Farmers of America, National Gold Level, Entrepreneurship Award for cattle farming; and the 2005 Future Farmers of America, Tennessee Star Farmer. Bynum is married to Kate Moore Bynum, and they have one daughter, Roane Alexandra. As 2019 Secretary-Treasurer, Alex is available to update Local Associations and other audiences on timely real estate topics from a statewide perspective, provide information about member services and benefits and listen to any insights or ideas that could be shared at the state level.